Hello, my name is George Hunt. Today I want to speak to you about my forthcoming visit to North Africa. Business-wise, I am looking for entrepreneurs to begin mining potash in the Western Sahara. Second, I need a rest from my two intense years of videotape presentations, public speaking engagements and correspondence. The third reason for my trip, the most important reason, is to enlighten the Muslim people that Al Qaeda is methodically destroying the Muslim society piece by piece while the bankers of the U.S. and Europe are funding these campaigns of terror. The intention of the New World Order is to overwhelm and destroy the People of Muhammad and the Koran with armed violence. The West has created terrorism that is ripping the Muslim nations apart. They have instigated the recent North African rebellions, breeding chaos to unseat the governing authorities of the North African regions. 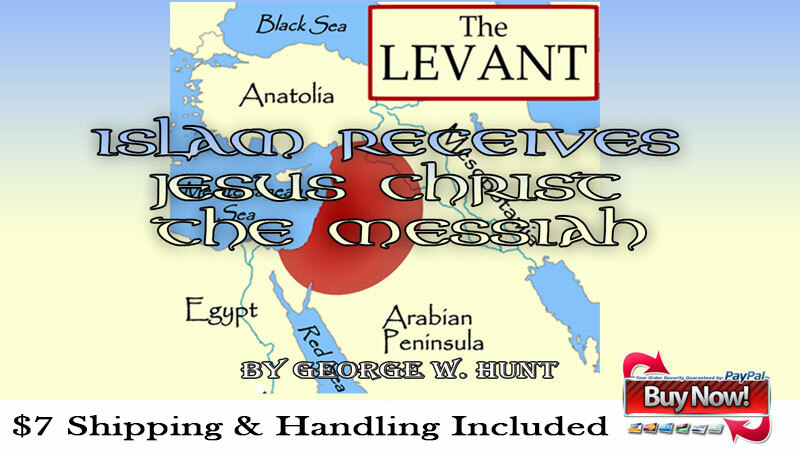 Muslims believe that Jesus Christ (Isa) will return at a time close to the end of the world. That time is now: their Redeemer is poised to be embraced by the Muslim people. The Koran, Muhammad the Prophet of God, the New Testament, the Old Testament and the Torah actually agree with one another, with few exceptions, that Jesus will descend at the point of a white arcade east of Damascus Jesus is considered a Muslim because his life embraced the teachings of the Prophet Muhammad. The Muslims believe that Jesus, the son of Mary, will slay the Antichrist and then there will be one community of believers in Jesus Christ: the Muslim community. In Sahih Bukhari Volume 3, Book 43, Number 656, Abu Huraira, Allah’s Apostle, said, “The Hour, will not be established until the Son of Mary descends among you as a just ruler.” Based upon Muhammad’s prophetic teachings, Islam will accept Jesus Christ and I believe that time is fast approaching. The time has come for Islam to take the cross of the Messiah on their shoulders and defeat the enemies who wish to destroy their lives. Signs and wonders will follow the people of the Book as they spread the Good News that Islam and Jesus are one. The Book of Mark 23:26 tells us that a person named Simon the Cyrene (of Libya), was forcibly pulled from the crowd to carry Jesus’ cross for Him. Simon was the only person who helped Jesus in his death-march to Golgotha and now Simon, Muslim Africa, is, again, being called upon to carry Jesus’ cross in these end times. Edmond de Rothschild admitted once that the only thing the Rothschild Dynasty feared was the Levant, the Muslim people. If Islam would only awaken themselves of the doom planned for them by their enemies and follow Jesus, it would dramatically change Rothschild’s plans for world conquest of all people everywhere. I am very pleased to be included in this wonderful act by the Holy Spirit. We’ll all see what happens when and if the miracles, signs and wonders of supernatural occurrence come to pass in the Muslim world and make them believe in their Messiah, Isa. More information about Jesus in Islam can be found in the Wikipedia under “Jesus in Islam”. I hope you are not offended with this religious-type message.